This Mixed Berry Crumble is naturally sweet with a pistachio twist on the traditional crumb topping. 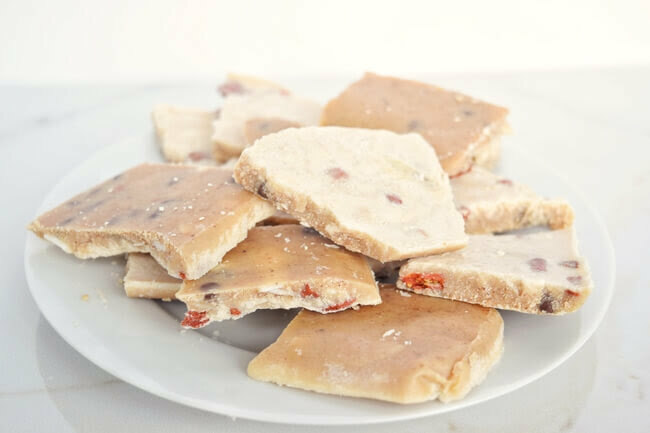 Free of refined sugar and paleo friendly, this will satisfy any sugar craving you have! Every time I go grocery shopping in the summer, the fresh berries catch my eye. They basically stare into my soul and beg for me to buy them. Whole Foods has been having a sale on their organic strawberries pretty much every week this year so I'm confident that I have already eaten my weight in berries this summer. They're so fresh and juicy it's impossible to resist, Some sliced strawberries on their own or paired with a bit of coconut whipped cream is the ideal dessert. Even though I love them that way, I really wanted to create a gluten free dessert to use them in that would really let them shine. Coming up with a dessert that could use a combination of fruit or just the household favorite was an added bonus. Because if you don't want to decide between blueberries, raspberries, strawberries, or any berries - you shouldn't have to! I love a good fruit crumble, but I always seem to encounter apple crumbles. Uses berries allowed me to switch up the norm. This paleo friendly dessert is free of refined sugars and contains hardly any added sugar at all! Just four tablespoons of maple syrup/honey are in this whole dish. Since fruit is naturally sweet, anything more than that would have been sugar overload. That's one of the reasons I love using fruits in my recipes - just like with my dairy free banana bread muffins or my caramel pear upside down cake! I made this mixed berry crumble with a combination of frozen strawberries, blueberries, raspberries and blackberries, but you can switch it up to combine any fruit that you'd like! It is an awesome recipe for fresh fruit during their peak season but making it with frozen fruit means you can keep it on your menu all year long. I ate my first piece of this crumble when it was fresh out of the oven and still warm. I imagine pairing it with some dairy free ice cream, like Luna & Larry's Coconut Bliss, would be epic. This crumble cooled down tasted just as good! Chicago experienced an insane heat wave and I couldn't begin to think about eating it hot, so I ate it straight out of the fridge. I must admit, I almost liked it more. When a recipe can be served any temperature and still be good, then it's sure to be a hit! 1. Preheat oven to 350 degrees.2. Very lightly grease a 7x11 baking dish or two smaller baking dishes.3. Combine all filling ingredients in a bowl and pour into baking dish(es.)4. Now, mix all crumble ingredients in a separate bowl.5. Spread them over the top of the fruit filling.6. Bake for about 45 minutes until the filling has started to bubble and the top is slightly browned.7. Serve warm with ice cream or cold on a hot day!